Despite that this quarter is the one when the current iPhone gets old, and a new one traditionally appears, the biggest five markets in Europe saw accelerating switch from Android to iOS, says research firm Kantar. Great Britain, Germany, France, Italy, and Spain saw a cumulative total of 27% of smartphone buyers going for iOS gear, instead of Androids. In the US, the situation was far more muted, as only 9% did the swap. When it comes to China, after briefly taking the top spot in June, Huawei gave way to Xiaomi, though Huawei's brand recognition remains stronger there, so Xiaomi will have a steep climb ahead if it wants to stay at the lead. That means two things: 1) People where after large screen phones, because performance wise, iPhone 6 is not way better than iPhone 5s, specially for average user. 2) When you have a marketshare like android (~90%, ~70%, ~70% for Spain, France and Germany), if you buy and iPhone, the odds are 2:1 that you came from android. At the end of the day having the $'s it's a damn hard decision between going for an iPhone 6/6+ and a top notch Android phone like the galaxy S6 edge. In my case I chose.....both! Curious as to how that is hard. The only thing the 2 have in common is nice build quality. After that, the S6 is all top dog in every single aspect. The decision would be quite easy if you just want one phone, just pick the best of the 2. But since you chose both, that's probably even better. But owning 2 devices that basically does the same thing seems pretty insane. Which one do you use most? I tried using 2 mobiles. I use a Galaxy and I had an iPod Touch. iOS quality in apps is still unmatched, but that has to do with the skill of the dev, the fact devs choose to make iOS apps better and because the code for making apps is better than Java. so what does this mean? Size matters! YeaYea, all that cognitive dissonance washing away, so many therapy jobs lost. I don't think you are just cynical. The numbers just doesn't match at all: 27% could not have swapped, as in Germany only 15% are buying iOS, and in Spain merely a 6% So it's clear the numbers are being played around (like 27% of the iphone buyers are coming from Android, or something like that) The real information seems that was lost in the chain of copying/making big bait headlines. Silliest comment of the morning. Just plain silly, childish, moronic, etc. You can tell how dumb this guy is just from reading his comments. Delusional, discrediting others... Kids you shouldn't buy iPhone if you can't afford proper education. Really? 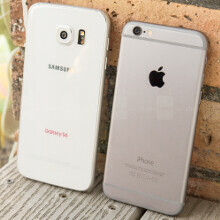 This years Galaxy S cocts more than the iPhone and so does the Note. The S starts at 599.99 on Verizon whiles its closer to $700 on GSM carriers. The S6 Edge starts at $699 more than the $650 for an iPhone. According to facts, the Note and S have combine since 2011 to sell well over 150M devices per year. While Samsung sells over 300M phones per year. That means when they sell 80M phone in a quarter, more than 1/3 are flagships. I hardly think price is an issue. Both are good. Doing a 6s Plus this time. Still might get Note 5 down the road. Where is Techie? Just finished Game of Throne novel. Need something else to read. Here I am. I wont write a novel. I have a problem with the claimed numbers. Apple always rattles off numbers at their events when releasing new iPhones and I expect Cook will do the same this year. I google Italy's population which is roughly 60M. If the article is right, 3M people in Italy switched from an Android is the claim. However in 2013 Windows Phone was still the top selling device. Are we to believe in just 2 years, all these people specifically switched from Android to iOS? I am willing to bet 100% on my life, all 3 million of those people didnt have an Android device and switched to iOS. Especially since Windows Phone has been having good sales in Europe vs the USA. And Nokia has a huge share of many European countries as late as 2013.Most of those people probably finally dicth Symbian phones and like Windows Phones too...not just Android. LOL - 27% of what? Of all smartphone buyers? Not likely - Apple wouldn't have ~10% market share in EU. Of iPhone buyers? - Not hard, concerning Apple has so low market share in EU. Of first time iPhone buyers? - Probably - It wouldn't be the first time news outlet spined that story around. It's from all the phone buyers, if we got the numbers about people who swapped to Android it all would make perfect sense. It can't be first time iphone buyers, as then the number would be much higher. Apple+Android are over 95% in Europe: if you discount Apple ones (are they would not be first time buyers) most of the first time buyers HAVE TO come from Android: over 80% for sure. So most likely your second option: of iphone buyers. But the headline is made in order to look like now every Android user is moving to iOS in Europe. When you make the numbers: 26% of 15% is around 4% of the total users. In other words: less than 5% of the Android users are switching to iOS, and of those you should discount the ones switching from iOS to Android, which are probably a similar number. It's simple really, over 50% of the world's population consist of women and girly men. These people have desperate needs to buy cosmetics and fashion-accessories like an iPhone, real men don't. iPhones sell well because they are purchased by OVER HALF of the world's population for use as a beauty product. Androids are not lipsticks or earrings, they are useful productive tools so they are sold to real men which make up a smaller percentage of the population... thank god! Like the S6 or the Note 5 ain't part of the "beauty product category"
Sorry, the only fashion accessory I see women and girly men flaunt is their pink iPhone, not S6 or Note5. So as far as they're concerned Samsung does not sell beauty products or fashion accessories. Again, only real men have the brains to wield and make full use of the incredible and powerful piece of technology such as an Android phone. Now why don't you go get yourself dolled up then grab me a beer and go make me some dinner. "I want and S6/S6 Edge or Note to match my shoes or purse" - Says no one ever. I have with my own ears listen to a female request an iPhone in a particular color to match the wallet case she bought and she ended up with buying a new case at the store because the iPhone was available in Blue like the iPod Touch was. I do agree, iPhone has become more of a fashion accessory vs a useful computer. Of course you think it's ugly Ninetysix, it doesn't match with your purse, high-heels, purple cashmere sweater, waxed eyebrows and beard. You're the one who implied it brosephone :) Does your boyfriend have an iPhone?